The RC Flyers are getting ready to fly. We fly when it’s breezy but not when it’s windy! Summer has arrived, and some of our members have flown the coop for cooler temps. That leaves even more free air to enjoy. We will not be having any club meetings until the fall, so just come out to the field and fly or watch. The Robson RC Flyers welcomes newcomers to join our flying club. Most of us are flying the “foamy” category of planes. Plenty of scale realism and flight characteristics much like the real thing. And they are easier to repair if a “harsh ground intervention” occurs. You can get started in the hobby for as little as $100 or as much as you want to spend. It is a hobby after all. An excellent trainer/sport plane can be had for as little as $200 ready to fly (RTF). Charge the battery, mount the wing and fly. The RTF versions include everything needed to get in the air and make a good starting point for the hobby. If you are a “build it” kind of person, the ARF (Almost Ready to Fly) is a good choice to start. 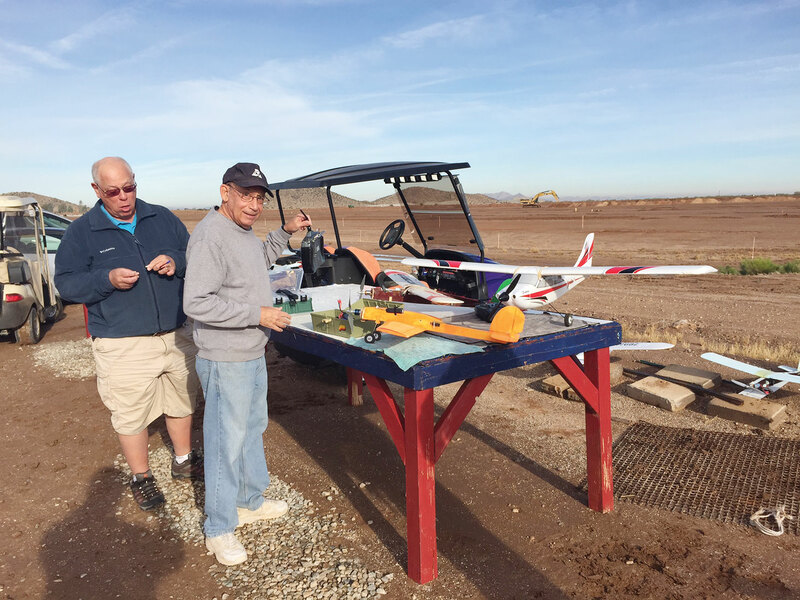 Club members will be glad to offer assistance in selecting your first model and getting the plane trimmed out for stable flight and safely back on the ground. Our planes range from 1.2 oz. lightweights to the larger and more acrobatic planes. There are also scale warbirds and basic functional planes for more relaxed flying. Our president, Eddie Peril, makes his own planes, which gives us a lot of variety to watch. Our flying field off Harris Hawk has lots of air and very few obstructions: not a single cactus or tree looking to snag a wayward plane. Our official flying days are Tuesday, Thursday and Saturday, but we’ll fly pretty much whenever the winds are light and the temps are moderate. Flight times are variable to allow the temps to rise in the morning. As the days transition into our milder temperature range, flying will be whenever we feel like it, but the Tuesday, Thursday and Saturday mornings will still be the organized flight schedule. Contact Eddie Peril at 520-374-2599 or Paul Downey at 520-876-9507 for further information.